For heated greenhouses sow February. Will still fruit from sowings as late as June. Round apple-sized fruit. Very prolific. 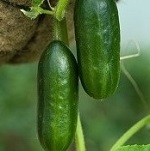 Pickling variety with almost smooth, medium to dark green fruits with good resistance to scab amd mildew. All female. Crisp and delicious. Pick when small. 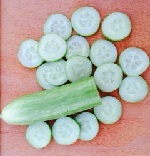 Can be grown in unheated greenhouse or outdoors. Replaces Cucino. Small - pick when a few inches long. All female. 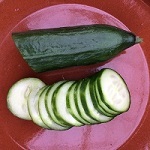 Very prolific, half-sized, crunchy, tasty cucumber. All female. Best grown indoors, except in very warm sheltered places.